Whether you are just starting out researching grow lights or you already have purchased your grow lamp, you will likely have been exposed to a variety of grow light numbers. Some of these include lumens, watts, photon efficiency, foot candles, LUX, PAR, PPF and PPFD. They are all useful terms for lighting but they are not equally weighted for their importance to horticulture. With that in mind, we’ve broken apart the terms, the importance of each and we’ve charted this, both on a stationary grow light and on a LightRail light mover. This is an eye measurement so it’s from a people perspective. It involves a photopic bell curve where humans are more sensitive in the middle (green light) and less on the ends (blue light/red light). Humans miss out a lot on the blue light/red light ends of the photopic bell curve. Measures lumens in meters as lumen/m squared. Measures lumens in feet as lumens/ft squared. Because lumens, lux and, foot candle meters use a more visible, human eye type spectrum, they are a little weak on the far ends of the photopic bell curve. It’s true that humans don’t need the red and blue colors to see well, but plants absolutely use these colors as the fuel for photosynthesis, so we need those numbers fairly represented. Therefore, Lumens, LUX and foot candles are not very useful in understanding grow light output. So, in the purer sense, these are not useful terms. We are getting closer to what really counts. PAR is the wavelengths of light within the visible range of 400-700 nanometers which is important for photosynthesis. The actual term is photosynthesis active radiation and there is the acronym. The issue with PAR is it is not so much a measurement as it is a concept. In other words, it is not per time nor is it per space. We can, however, concentrate it or dilute it, and we do that with distance. That is an example of Inverse Square Law. PAR does factor into PPFD and so, as that relates to PAR and distance, take another look at the PPFD chart above. We can see that Inverse Square Law is a hugely diminishing effect with distance. It’s geometrically diminishing. As to the actual grow light output, PAR is somewhat useful in that we have a good idea of the PAR number the grow light produces, and we can compare that number with other grow light output. So, it is a number but it is a concept number. This is a measurement of PAR, per time, so it gives us one more layer of information. For grow lights, this is important information because we can see photon output per second. A quality grow light will give continuous bombardment and PPF tells more of that story. The actual measurement is micromoles per second, or μmol/s. In other words, PPF gives us a measurement of grow light PAR. This is the ideal measurement to have in that we have space and time in the calculation. It is PPF with the addition of micromoles per meter (3’3”). So, we are now measuring photosynthetic photon flux density (PPFD), and it is measured per second AND per meter. Proper PPFD meter readings are taken over time and include distance to grow light, horizontal coverage information and the number of measurements per a period of time, which should be a very high number. Then, PPFD meter programs will typically take the average. For the PPFD chart above, the LightRail light mover versus a stationary grow light, the distance to the grow light and the horizontal coverage distance are both listed. The meter took a reading every 30 seconds, so 120 readings per hour, and calculated for an average every 30 minutes. And, that was per area. This gives a good idea of what should be involved with getting proper, accurate PPFD readings. This is worth a mention and is typically used for an overview only. We use watts in general terms and not for accuracy. In other words, a person’s general experience might be to know that 600 watts will not deliver for a specific plant but 1,000 watts might be overkill for some other species. Personal experience has a lot to do with wattage references. This refers to how efficient a grow light is at converting electricity into PAR. This also takes the watts measurement to another level of understanding. In other words, we are not just referring to electrical input but are now also referring to that in relationship to realized output. To calculate the math and knowing PPF (µmol/s) plus knowing wattage (Joules or J/s), the formula is µmol/J because the “s” for seconds cancel out on both sides of the equation. Then, the higher this number becomes, the more energy efficient a given grow light is at turning electricity (input) into photons of PAR (output). PPF, PPFD and photon efficiency are the three most precise and telling grow light numbers to know. When choosing your next grow light system, be sure to review these specific grow light details for the best possible growth rate and yield output. You have the right grow light, now move it! You have spent good money on your grow light system. Now, maximize each grow lamp to its fullest potential by efficiently moving it. The PPFD difference with LightRail light movers is dramatic and that movement of each grow light allows for another level of control for the indoor plant light. 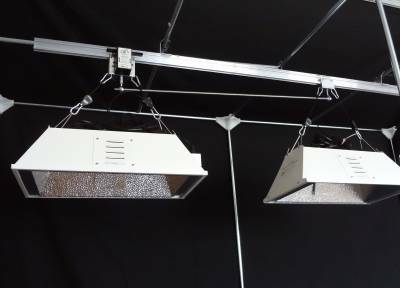 There is better coverage and a more even PPFD coverage, with the ability to position the grow lights closer to the canopy for better grow lamp efficiency. A moving grow light also creates a more even canopy along with better light penetration. The result: A better sun-like affect for growth rates and yield output, and those PPFD numbers explain why. Each light mover also allows for about 30% more area covered, per grow light. 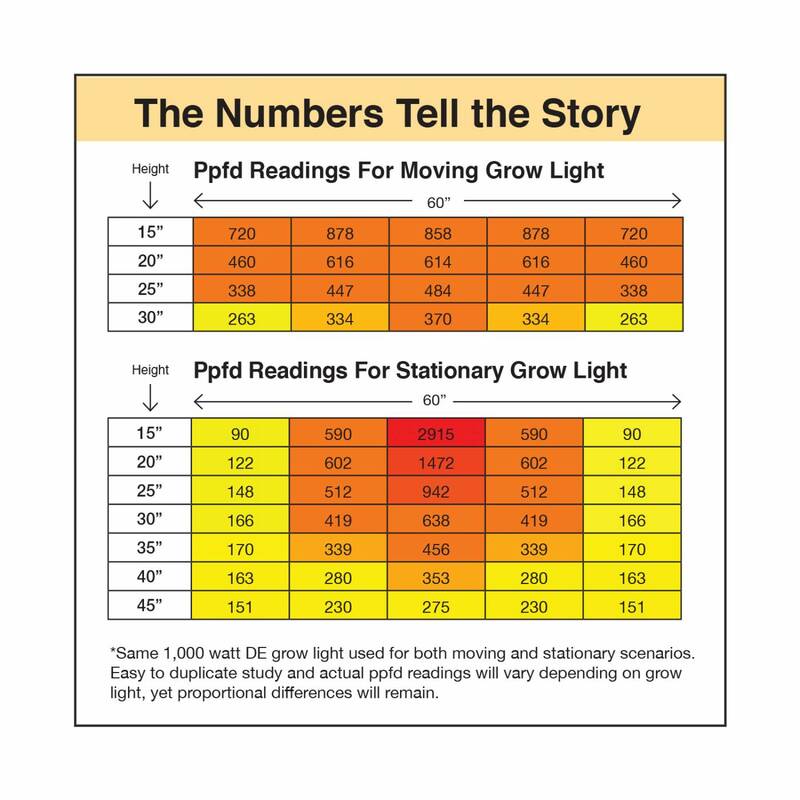 Grow light movers supercharge grow light systems, as the above PPFD chart shows clearly. You can only get this with LightRail. To get started, find the right light mover for your plants with our LightRail Light Mover Kit comparisons.